Benton’s reference to Twitch.tv — the hugely popular site where gamers share a video stream of their video game sessions — is perhaps both opportunistic and apt. Opportunistic because Twitch, which launched in 2011 as a spin-off of Justin.tv, was eventually acquired by Amazon for just shy of $1 billion. Apt because, like watching other people playing video games, DJing for some is about as visually compelling as watching paint dry. Yet Chew places a lot of emphasis on the video side of what is otherwise a music streaming platform. Users are expected to share a video stream alongside their audio. Not only does this set the UK startup apart from audio-only competitors, such as Mixlr, but, similar to how Twitch targets gamers, is enabling it to tap into an extremely passionate community of professional and amateur dance music DJs, who are both content consumers and creators. “It’s estimated there are over a million professional DJs around the world, and millions more amateurs. And, of course, there are the hundreds of millions of dance music fans,” says Benton. Paul Smith, who heads up Ignite100, the UK accelerator that Chew has just graduated from, echoes the Twitch comparison. “There are a lot of parallels with Twitch.tv, which essentially allowed gamers to follow other gamers and learn how to play. Because streams are in-vision, there are also amateurs learning from professionals – it’s not just listening to music, it’s also about learning how the set was produced,” he says. And, of course, in addition to the live audio and video streaming aspect of Chew, the startup has begun to amass a library of “specialist dance music”, positioning it to become a niche Spotify-style service. “But it’s a really big niche,” adds Smith. This means that Chew is also catering for “those who want to experience the mixes rather than create them,” says Benton. Thus Chew is a community, platform, and music library, prompting me to raise the thorny issue of licensing. 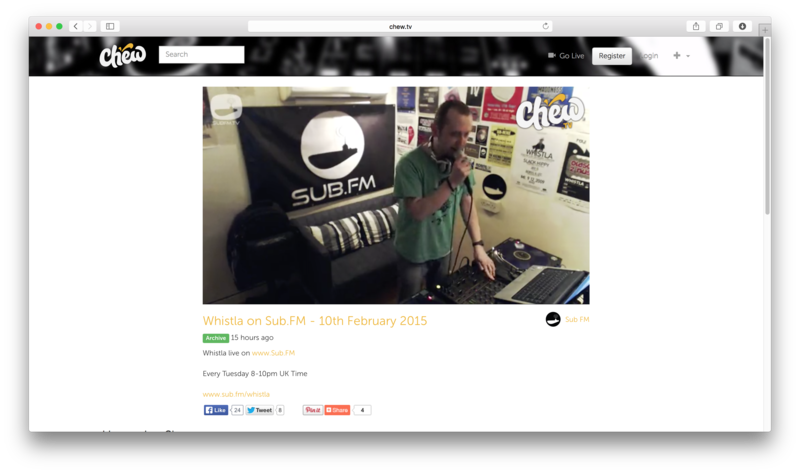 Benton says the startup is “licensed and legal to the fullest extent possible” and that the likes of Mixcloud and Mixlr have, to some extent, created legal precedents for what Chew is doing. In practice, this means that the company is operating under a blanket license for as long as revenue remains below £200,000. “So it’s probably good for you guys not to make much money then?” I joke. “Short term, definitely” says Benton, laughing. The longer term plan, however, is to generate revenue through sponsored content, DJ gear brand tie-ins, ‘Pro’ user accounts, and events. In the meantime, Benton says Chew continues to have conversations with rights holders for when (or if) it starts to generate revenue. “We’re looking to build a sustainable business, we want to monetise the platform in a way that adds value to content creators and rights holders,” he says.